AirTV, a wholly owned subsidiary of US satcaster Dish, has launched a new streaming device that integrates free over-the-air channels, Netflix, Sling TV and YouTube. The 4K Android TV-based AirTV Player will be available alongside AirTV Pro Install – a service that offers expertise, installation and set up of over-the-air (OTA) antennas. “Americans are rediscovering free local, over-the-air TV for sports, shows and news, particularly given how well OTA complements popular streaming platforms like Netflix, Sling TV and YouTube,” said Mitch Weinraub, director of product development for AirTV. OTA channels are available across the US and consumers in many markets can receive dozens of local channels, including ABC, CBS, FOX and NBC. 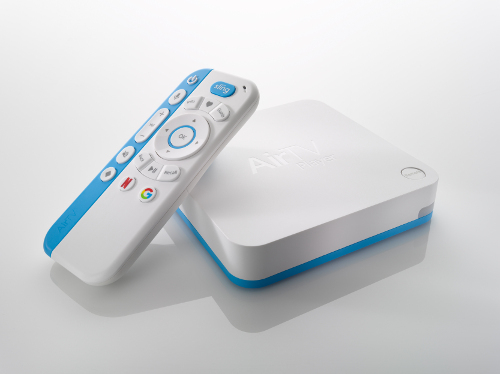 Built on the Android TV operating system, the AirTV Player can broadcast OTA channels using an AirTV adapter and an OTA antenna, and also offers streaming services and content from the Google Play Store. The player is WiFi and Ethernet compatible and connects to a TV via HDMI. “AirTV Player simplifies what has been a fragmented viewing experience and integrates a customer’s entertainment options in one easy-to-navigate app,” said Weinraub. AirTV Player with the optional OTA AirTV Adapter is available in the US for US$129.99. AirTV Player for streaming only is available for US$99.99, while a standalone AirTV Adapter is available for US$39.99 if a user chooses to add OTA integration at a later date.